More Care Bear wrapping paper! 24 sheets all together, 12 packs all 2 full sheets. 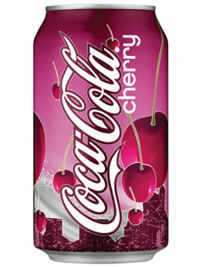 They were still all piled together in manufacturer packaging. Pretty great. I don't give out many presents, but next time I'll be presenting it with fabulous Care Bear wrapping paper from 1983! $2.99! Value Village! 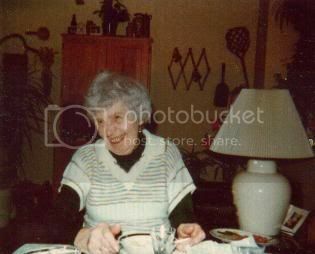 Found photo. I like it. She seems like she's really enjoying herself. Enjoy life. A quick stop with the wife to Funky Junky in Kensington Market here in Toronto after stopped at our current favourite restaurant at Spadina & Sullivan named Pho turned up South Park magnets & hot dog wiffer stickers. One purchase was mine & the other was the wives. Can you guess which one was mine & which one was his? I'll give you a sec. 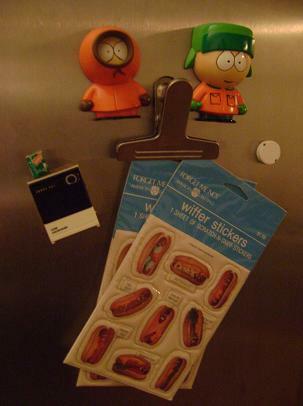 If you guessed that the hot dog wiffer stickers were mine you'd be correct. Each pack was marked $3 each, as you can see I bought the only 2 they had left. They are original scratch-n-sniff stickers from 1984 (mcmlxxxiv) by American Greetings. The South Park magnets are the wives. I told him I'd only buy them if he didn't take the packaging off, like always he didn't listen. They were only $5, still sealed, so I'll let it pass. This time. The guy cut us a deal, $10 for all. So it wasn't too bad. YOU KNOW THAT THING YOU'VE BEEN SEARCHING FOR FOR ALL THESE YEARS AND YOU NOT ONLY DIDN'T KNOW IT EXISTED, BUT YOU NEVER KNEW YOU WANTED IT & NOW YOU CAN'T LIVE WITHOUT IT? I love those kinds of things. So, I did go to a thrift today. I was a lucky guy at one point where the clinic I go to (as well as my family doctor who doesn't practice there anymore so I found out) is in the same mall as a Goodwill! I always used to go check in & instead of waiting, hit up the thrift & come back. It was fabulous. However, my main reason on going up to the area today surprisingly enough wasn't to visit Goodwill, it was actually to hit up the doc. I needed a refill on my seizure meds & my legs have been killing me lately, like terribly bad. So, the place closes at 8PM, I get there at 5:15PM, "due to the high volume of patients we are no longer taking anymore patients today". You're not here to hear all of that are you? You're hear to see junk & treasures, so let's get this show on the road. Like my new couch? It's blue. I never in my life thought I would be carrying another couch on the TTC, but luckily, this one isn't 3 feet tall, it's just over 30 centimeters tall! It fit comfortably in a large plastic bag with all 3 of it's legs sticking out. I usually don't buy broken items from the thrift, but I couldn't resist this couch. I thought it was amazing & Pee Wee Herman would look great on it. I'll get to Pee Wee in another post later this week. You won't regret waiting for it. Anyways, so the front leg is broken, but it can be fixed, can't it? Whatever. Want to know a fun fact about the couch? It actually has crumbs in the cushions! The couch was $7.99. A bit much, but seriously? Can you blame me? I bought this Cornwall canister. I don't really know what it's about, it states it's humidity controlled.. what is it? Some faux Tupperware or something? Is it like a thermos? Anyways, I am going to put knick knacks in it. This is cute. So very cute. A cute little dishwasher magnet for our fridge! Made in 1992 by Acme, in China. Also pictured is a C+C Music Factory cassette single for 'Things That Make You Go Hmmm...', The Breakfast Club Soundtrack vinyl, Josie Cotton vinyl (poor girl played Pride this year at the same time as Cyndi Lauper on the other side of the city, wonder who went? 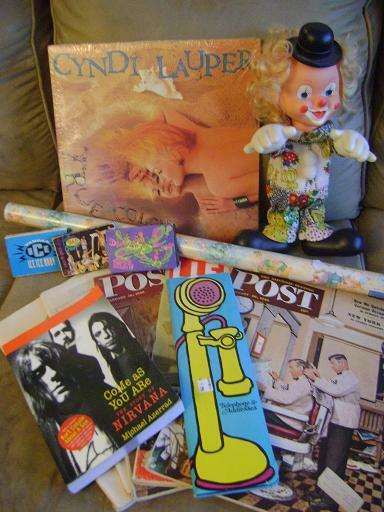 ), Little Shop of Horrors vinyl & some found photos. They aren't really that exciting, but if I ever fix that scanner you bet you'll be seeing them! After Monday & Tuesday, even the calender says W T F ! Made a trip today to a Value Village. My intentions of going to the west side were to pick up some lemon juice, chicken & peppercorn. Know what I was going to do with that? Make lemon peppercorn chicken. Well, like always I got sidetracked. I picked up a few cool things today. The most exciting being the Laverne & Shirley board game. This baby has all pieces as far as I can tell is in good condition & have Laverne & freakin' Shirley on it! That was the selling point. Good marketing Parker Brothers. I have no idea what the game is about & I am sure I'll never play it. This one cost me $1.99. I was quite excited when I picked it up. I kept thinking someone was going to steal it from my basket so I maneuvered other items on top of it so it'd rigor my attention if anybody was to go into the basket. They'd have to be pretty crafty to get past me. Probably just paranoia, I mean, this isn't the St. Jamestown Goodwill I'm talking about. I also got a book I found very unique. I had to talk myself into getting it though. I kept telling myself, "if you get this, you'll be closer to having one of everything." This is 'The Bathroom Guest Book', you can check it out on Amazon RIGHT HERE!, but you're not like me, you can't get it for $1.99 in a bag at Value Village with your 1980s Valuepack of blank read envelopes & cards telling you it's fun to create your own greeting cards & that they are 'GREAT FOR RUBBER STAMPS!!!'. You can't get yourself one for less than $15.22 (at the time of posting) on Amazon, but you could probably get one cheaper on eBay. Used books meant to be in the bathroom are on my "DO NOT BUY" list, but, it has yet to be written in & I have told myself that it was never in someones bathroom (even though I've wiped it down over 5 times already) & that I need to have one of everything & that one of everything has to come at a rock bottom price! [Surprisingly enough, I just checked eBay & at the time of posting, there is not one ended or active listing for this book!]. They have different "Privia", their version of trivia, Bathroom Graffiti, Bathroom Banter throughout the book on every page too, quite fun to read. I also picked up a very worn copy of The Rocky Horror Picture Show on vinyl & great condition The B-52's 'Wild Planet' on vinyl. They were both a $1.99 each (this ain't now Goodwill folks!). Two back issues of Vice Magazine, an issue of Men's Health from June 2004 (yet I get french fries for dinner..) & an issue of Dazed & Confused magazine from September 2000 with Marilyn Manson on the cover. All mags are a buck each. Above is a book I bought for $3.99. It's called Spilling Open: The Art of Becoming Yourself. I thought the book looked like an interesting read & might offer me a little inspiration in areas I need it, so I picked it up. 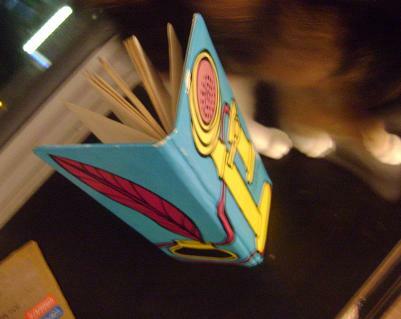 Anybody could basically make their journals, or mock journals, into a book, but not anybody could get a book deal. You can read about this book on Amazon RIGHT HERE. Just a quick update on a few things in case you were curious! I sold my U2 My Prerogative t-shirt for the listed price of $19.99. A pretty sweet deal. Upon creating a thread about my small little plate, "It starts when you sink into your arms & ends with your arms in the sink", I found out that the saying first appeared in print in a magazine called "The Rotarian" in 1951. Thanks for that tidbit melonhed. You can view it here if you like! It's a scan of the original printing. A few others suggested it was from the '50s & after looking at the advertisements in the mags I bought yesterday, I figure that they must be right. From the '50s. Same kinda drawings. Know what I mean? I only bought those magazines for the vintage adverts. I plan on posting some one of these days. Who is & who isn't charging HST. Goodwill, Salvation Army are not, I have heard Value Village is.. who knows!? Today I went to finish off my passport application so I can finally set off to the states & check out some of their thrifts and flea markets. When I get to the passport office the small breeze from whipping open the door is it brought to my attention that I forgot to put on deodorant today! For the rest of the day it smelt like I was being followed around by a cheeseburger. 92 degree weather, walking a long distance and the lack of deodorant is never a good thing. Passport will be here before or on July 26th, so expect me to be in Michigan soon! So, there is both a Salvation Army & another shop called 'Double Take' sorta within walking distance of the passport office, so it being a beautiful nice day & me finding deodorant in the back of the wives bag, I decided to go. I do not make regular stops here anymore, so it's usually a waste of time. The last time I bought something from either store was 10 months ago - an unopened roll of N-Sync wrapping paper. 49cents. I used to regularly come to those shops, but after they closed the Goodwill, it stopped being worthwhile. To my surprise, I had some nice finds this trip to the Salvation Army. Double Take had nothing. I considered buying this mushroom light switch cover from the 70s, but decided against it. Would look hideous in our condo - and not the good kind of hideous. 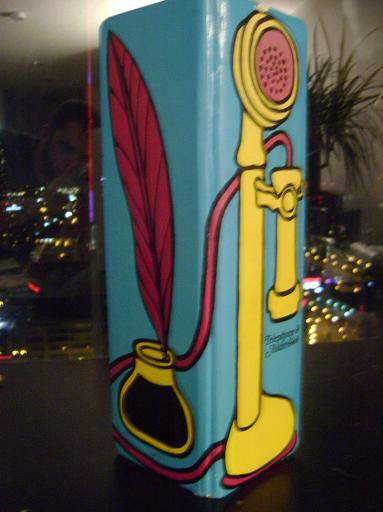 You'll see I found a beautiful vintage telephone & address book, $1.99. It has some disappointing wear just on the top edge of it, but it's never been used. A roll of unopened Care Bear Cousins wrapping paper, 49cents. 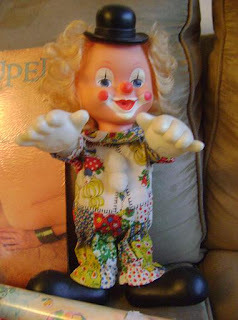 That ugly clown doll was 99cents, made in Hong Kong. It has such beautiful curls. Also picked up 4 'The Saturday Evening Post' magazines from the 1940's, which were originally 10cents. I paid a gigantic markup of $1 each. Also one Life Magazine that I didn't know I was buying from September 1957. A buck. This Salvation Army has really given itself a makeover in the past few months. It used to be so junky, stuff thrown everywhere, had to jump over stuff to get to other stuff, cds, tapes were a mess. It's very inviting, cleaner & organized. Even the drug addict employee seems different. I went to my favourite Goodwill. Stuff in this store has such a quick turnover, I used to visit this place 4-5 times a week when I was within walking distance. 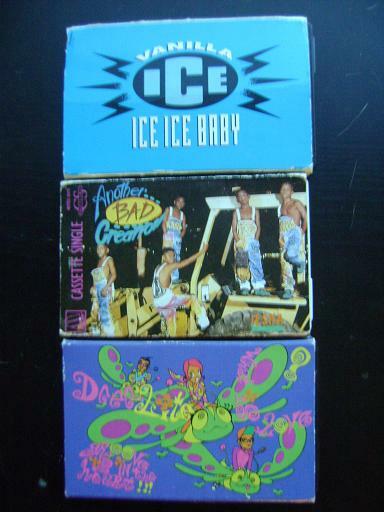 I bought 3 cassette singles. I've got a thing for cassette singles, I really like them. I got: 'Groove Is In The Heart' by 'Deee-Lite' (1990 Elektra Entertainment), 'Iesha' by 'Another Bad Creation' (1990 Motown Record Company) & 'Ice Ice Baby' by 'Vanilla Ice' (1990 SBK Records). Each cassette was a reasonable, HST free, 49cents. I also picked up "Come As You Are: The Story of Nirvana" by Michael Azerrad. This came from my favourite Goodwill, who have the most amazing, organized book section I have ever seen in second hand store. Anyways, I have yet to read this Nirvana book. The last book I read on Nirvana/Kurt was Cobain Unseen & I had won it from a blog site. An interesting book. I might have normally passed this book up, maybe I was still pumped from the Hole show on Saturday, maybe I really wanted it. The world may never know. Anyways, it was $2.49. This Goodwill has made their books reasonably priced now too. This book would have cost me $4.99 at Value Village by their pricing standards AND it would have been HST taxable there! My last stop was my favourite Value Village. Part of my plan while going there was to stop at the supermarket to get some chicken, since the last time I was there the chicken was cheaper than the grocery store in my building. This time however, the prices were sky high! I just bought my reasonable priced, still sealed Cyndi Lauper 'True Colors' (1986) vinyl. 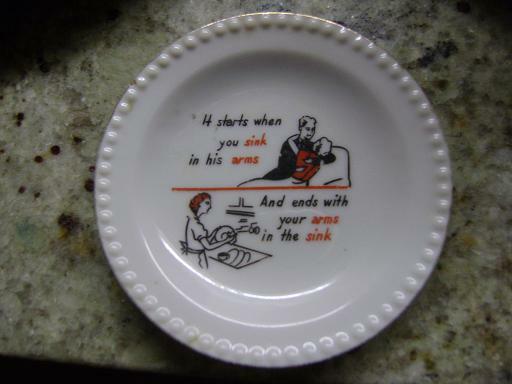 It starts when you sink into his arms and ends with your arms in the sink! It starts when you sink into his arms & ends with your arms in the sink! I bought this plate a little while ago. I walked around with it for about 20 minutes deciding if I wanted to spend a buck on it or not. I finally decided that YES, I wanted to spend a dollar on it & brought it up to the till with my other purchases (posted those awhile ago). I couldn't tell if this was an item like notepads, books, magnets that have similar says on it or truly a unique, vintage find. Since it had the vintage feel & look, went with my gut & decided it was. Would like to know a little more about the plate if anyone knows anything. It's about the size of my palm. My Google search only stumbled upon lesbian and feminist sites, but one posting in a message board stood out from 2005. A girl said her mother had a fabric hanging on her wall with the exact same saying. She had said 30 years ago.. so that would have been in the '70s. Was the same era I thought the plate was from! Toronto 2010 Pride came & went & I had a good time. One good thing was that Pride, like always, took place in the village, which Mix 40 (the only place in the city that sells Cherry Coke, Wild Cherry Pepsi) is right next to. Score for me for the drinks & score for you for the codes. Please, please, please be kind & post when you have used the codes so no other person wastes time signing into their account & trying to add the codes. Wednesday is thrifting day! Will let you know what I find.